As I write this we are getting ready for another trip to the desert to hunt meteorites. That’s pretty good for us. Paul and I have been lucky the last few years to get out once a year for a day let alone two trips for several days in six months like we have recently. Alan Gayda a friend we have not seen for a few years is coming down from Washington state to go with us. Should be great fun. We have hunted with him in the past. I have never written about what I take on a trip. So that is the topic this month as I pull all the stuff out once again and get it ready to go. Everything stays packed away together so it is easy to go through it. Typically we will hunt for six to eight hours a day and often do not return to the vehicle except for maybe a brief lunch. Most days we will take something light to eat and a lot of liquid and walk back to the vehicle in the afternoon after finishing for the day. So first on the list of equipment is a pack. I carry a small pack with a leather bottom so I don’t have to worry about dragging it on rocks and tearing out the fabric, It has several sections so I can keep food and drinks separate for the other stuff. It has pouches with zippers for pen and paper and size cubes and a loupe. There is in addition a diamond file, my GPS and camera. A few plastic baggies to put specimens in are carried in the large pack as well. 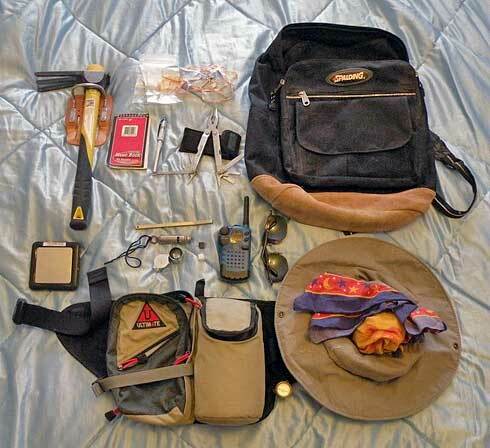 Not being too old that I have forgotten my Boy Scout training I have a compass, an antique police whistle, a knife and an FM Transceiver in another small belt bag. This bag is padded and is usually where the meteorites end up. It has two zippered pouches plus and outside zippered pocket. Sometimes we are in an area where we have cell phone reception so my cell is in a pocket. I cracked the glass on the outside display the last time I was at Franconia. The phone works but it may be time to upgrade again to a new one that has some paint remaining and is not cracked. I no longer carry a folding shovel as in years past. 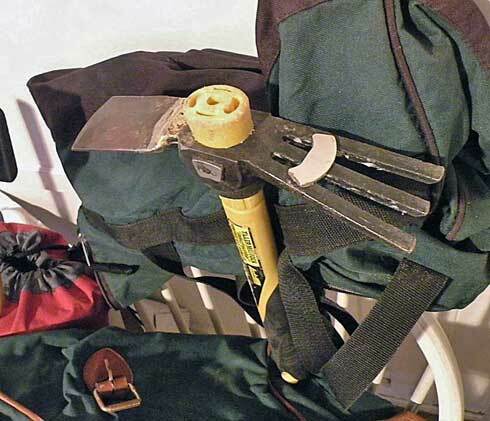 I use a combination digging tool like a small pick with a handle that hangs from a belt holder. Attached to this tool is a rare earth magnet. I usually have a telescoping magnet if I am using a metal detector. If I am not then I have my magnet cane instead of the telescoping magnet. None of the stuff mentioned so far weighs very much either by itself or in total except the digging tool. What adds weight to the pack fast is the bottled water and Gatorade that are essential to be carried in large amounts. We take at least two big bottles of water and two large Gatorades with us every time we head out. We plan our return to the vehicle based on the amount of liquid we have left some times. If it is really hot and we have drunk a lot we may have to go back and then head out again after restocking. Its pretty simple don’t get caught without liquids in the desert. But, in practice you can walk farther than you should and the weather change from cool to very hot so that you run out. Often we will return with some of the supply unconsumed but better safe than sorry. We take fairly light and easy food with us; like string cheese, peanuts, granola type bars. I never feel like eating much when on the hunt. As you can see in the picture my digging tool is broken, I am going to the garage right now and fix it. I will weld a new piece on the side that has broken off. I will have to reattach the magnets as well. But, it is not a big project and it should be fixed in an hour or so. The casting was very defective from the manufacturer. A big rust filled crack about two-thirds of the way through the metal showed after it broke. It was not from use since it broke the first trip I took it out; October last. With the pick repaired and three magnets attached I am ready to do some digging and iron attracting. I made a brazed repair instead of a welded repair. I think the braze will be a more flexible way to fix the tool. I had an old lawn mower blade that will make a great steel replacement. Often times we will wander quite far apart while hunting. On a dry lake we may be just at the edge of remaining visible to each other. I think this trip since it will be hot and the snakes will be more active we may be hunting closer together. There are enough dirt roads that we can drive to another area instead of hiking there and back. I have left out of course one of the most important pieces of equipment. The metal detector is always going along. And spare sets of batteries are packed for sure. I am using a Gold Bug 2. I have used White and Garrett detectors but currently I like my Gold Bug a lot. A wide brim hat with a bandana under it, keep the sun off my neck and ears. Sunblock applied in the morning before heading out is all that I have ever needed so I don’t carry the lotion with me. I usually wear long sleeved shirts to cover my arms from the sun. Sunglasses keep down the eye strain caused by reflection of the sun off the ground. My new camera is much smaller and lighter than my old digital. The spare batteries are also lighter than the AA rechargeable type I had before. I get a great many more pictures out of a battery charge too. A digital scale, and some higher magnification device then a loupe usually goes along and stays in my camera bag. We can have a better look and record the weights later in the evening while relaxing. Sometimes a laptop comes along to make notes in and to download the GPS track into. But, lately it has stayed home and I write in a journal. I download the tracks and find locations when I get back to my office. I expect the weather to be hot this trip and will plan for cool clothes for hunting. But, we will be up late looking at the stars so it could get cold as well. We’ll keep our fingers crossed for good luck that there are a few meteorites out there to find. But I am sure it will be a great trip even if the space rock are scarce.